MyHeritage and Legacy Family Tree Webinars are pleased to announce the launch of its foreign language webinar series. Broadcast live on the 2nd Wednesday of each month at 2pm eastern U.S. time (7pm GMT) at www.FamilyTreeWebinars.com, webinars are planned for the German, Italian, Finnish, Swedish, French, Spanish, Norwegian, Dutch and Danish languages. The first of the series will be live Wednesday, February 13, 2019 and presented by Gonzalo A. Luengo O.: Cómo explicar los grados de relación familiar (How to explain the degrees of family relationship). Expanding to these nine additional languages is another fulfillment of MyHeritage's promise when they acquired the FamilyTreeWebinars.com webinar series in August 2017, to further expand and enhance the webinar series. This enhancement follows the recent addition of providing the funding and development to add closed captioning to webinar recordings. "My goal here at Legacy Family Tree Webinars has always been to provide quality genealogy education to the entire world," said Geoff Rasmussen, founder and host of the webinar series. "With webinars in their native language, many more will benefit and I foresee lots and lots of new ancestors being found as a result. 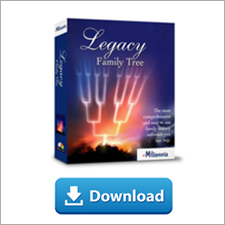 This partnership between Legacy and MyHeritage really is as good as I hoped it would be." 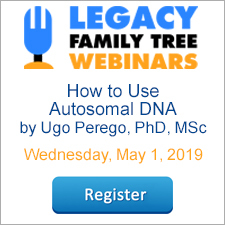 Visit www.FamilyTreeWebinars.com to browse both the Upcoming Live Webinars and the webinars in the library (857 classes to date). Or, to register for multiple webinars at once, click here. ¿Primo en sexto grado? ¿Cuarto grado de consanguinidad? Esta clase permitirá entender las diferentes formas en que se pueden mencionar parentescos y su utilidad práctica para la genealogía al momento de analizar documentación. Join us and Gonzalo A. Luengo O. for the live webinar Wednesday, February 13, 2019 at 2pm Eastern U.S. time. Register today to reserve your virtual seat. Registration is free but space is limited to the first 1,000 people to join that day. When you join, if you receive a message that the webinar is full, you know we've reached the 1,000 limit, so we invite you to view the recording which should be published to the webinar archives within an hour or two of the event's conclusion. Gonzalo Alexis Luengo Orellana, genealogista chileno y profesor de inglés, autor del blog Genes de familia, miembro de número del del Instituto Chileno de Investigaciones Genealógicas y secretario del Instituto de Investigaciones Genealógicas e Históricas de Ñuble. My French and Spanish are very rusty and my German was quite basic but I may tune in just to see how much I can understand. It may help me to remember some of my studies from long ago.